Why Join JACL? | JACL PSW in Blogland! Never heard the acronym J.A.C.L. when I was a kid but heard a lot about the differences between Japanese from Hawaii and Japanese on the “main land” (I assumed they meant L.A.). I was not picked on as a kid for the way I looked. I was not aware of racial discrimination in the 1960’s. The decision to join came in a peculiar circuitous route. Dust at Manzanar Relocation Site was so horrendous that I could not look up. 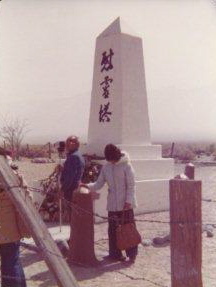 My first visit to the Manzanar Relocation Camp occurred when I was a student at UCLA in 1976. When the bus pulled up to the forlorn place, I was overwhelmed with the dust that permeated everything, especially wreaking havoc with my contact lenses. I was deluged with images of children, babies, women, men living and breathing the dust, living in sub-standard barracks, eating unfamiliar cafeteria food, having no privacy to pee or think in peace. I reported the visit to my ailing grandmother who burst into tears. I was shocked to see her cry in her delicate condition. Why was she so upset? After all, she was in Hawaii during that time period. Many years later, I found out that one of her daughters had ended up in the Arkansas camp and had given birth to a son there. 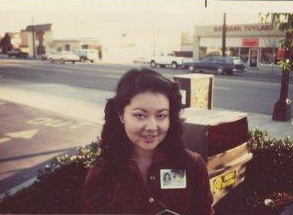 Outside my work office in 1980. I forgot about the incident as I moved on with my life, especially with the business of career. Within the first month of the job, I received a call from a man saying that we beat the Japs before and we can beat them again. This happened in the early 1980’s. A few years later, I married a guy whose roots were from Kansas. He grew up in California and so did I, and of course, we were Americans. We had a lot in common. But when his parents came over to visit, they removed their shoes at the front door with mild irritation and perplexity. When we visited them, we ate mashed potatoes, scalloped potatoes, baked potatoes. By the third meal, I knew something was missing. When we settled in Ventura County, I attended a Japanese Culture Day. A gathering with strangers for sure but I felt perfectly at home. I joined JACL and later, the board. What happened after that? It’s always amazing how life is full circle. I met Edwin and Marcia who grew up on the Islands and never mentioned “kotonks” vs. “buddhaheads”. They meld the American scouting experience with dried fuyu (persimmons). Talk about blending cultures together seamlessly. I met Ken who was taken to Manzanar shortly after his birth. He didn’t seem to be bitter about his experience. I met Cherry, Mori, and Ruby who were in their 70’s and 80’s and were devoted to our little club through fund raising, stuffing envelopes and showing up to events. The potlucks had plenty of RICE and comfort food (not chicken pot pie but dishes I saw when I was a kid). Board members at holiday party in 2011. The club members are quiet, unassuming worker bees who do as they say. They are not demonstratively affectionate but I feel intensely loved by them. They are always in “saving” mode as opposed to “spending” mode. Our government could learn a lot from these folks. When 83 year old Aiko comes to my house for a board meeting, she takes off her shoes with grace. I’ve received homemade mochi, oranges from a members’ orchard, and gifts from Japan simply by being present at a meeting. When I became President, a restaurant flyer was circulating that had the word “Jap”. I knew I could handle this uncomfortable situation because I had the strength of many people behind me, some who are members, some who left the club and many who have died. These folks are role models of the Japanese values of Enryo (humility) and Gaman (internal fortitude). I’ve never felt any resentment from these people who lived through a unique time period I’ve only heard about. I get to revitalize that part of me that goes way deep down into my Japanese roots that was not cared for earlier. So why did I join JACL? I get to complete my identity, my education, as to who I am. I draw from the bottomless well of our ancestry when we are together. I consider myself a lucky girl.